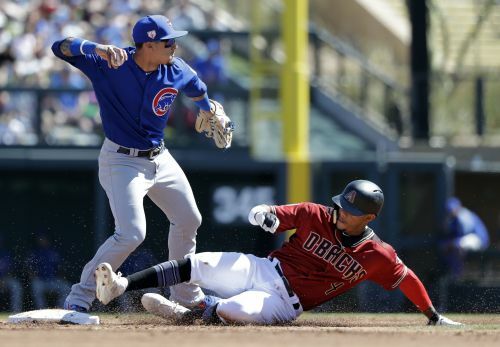 MESA, Ariz. (AP) — It does not take Javier Baez long to show off his magic tricks, even in a spring training game. The Chicago Cubs star singled in the first inning on Sunday against the Colorado Rockies and stole second, escaping a tag by shortstop Garrett Hampson with a deft swim move. "I wasn't planning on doing it — I just reacted to it," Baez said. "I got a good jump but I took forever to be full speed and the ball beat me. I saw it and just reacted to it. That's my first attempt to steal a bag in spring training. I just did it. We'll see how it goes." It was just Javy being Javy. Last season, the infielder known as "El Mago" — Spanish for 'The Magician' — set career highs with a .290 batting average, 34 home runs, 40 doubles, 21 stolen bases and a league-leading 111 RBIs. "I had a great year," Baez said. "I still think I can have a better year." Baez, 26, finished second in the NL MVP voting behind the Milwaukee Brewers' Christian Yelich last season. Baez ranked among the top 20 NL hitters in batting average, but also struck out a career-high 167 times. "It's a natural maturation process," Cubs manager Joe Maddon said of what he expects from Baez, who is entering his sixth season. "Probably, more than anything, and he's on to this, he needs to be a little more structured in his own strike zone, which would be awesome." That would mean cutting down on the strikeouts. "I'm working my walks, but I don't go out there thinking, 'I'm going to walk,'" Baez said. "I just want to see the ball better. On my 3-2 counts, I want to try to see the ball better and take my walks if I need to. Hopefully, that doesn't change my approach." There are some things defensively that Baez needs to work on, too. He will open the season as the Cubs' starting shortstop while Addison Russell completes a 40-game suspension for violating Major League Baseball's domestic violence policy. Russell will be eligible to play May 3 barring postponements. "The conversations have been good and he's saying all the right things," Maddon said of Russell. "I think he's coming to terms and grips with what he had done in the past and trying to move forward." In Baez's five seasons with the Cubs, he has started 199 games at second and 172 at short. If there's one goal that eludes him, it's winning a Gold Glove. He doesn't seem to stay at one position enough. "Right now, I'll stick to shortstop," Baez said. "When Addy gets back, we'll see what the decision is from the front office, if he's going to play shortstop or move to second, or I am (moving to second). It doesn't matter to me. "In the offseason, I was working on both positions," Baez said. "When I got to spring training, I was kind of lost at shortstop. A few days ago, everything got back on track. I was seeing the ball good, I was taking my steps good and my arm was good." "I was working on my feet and seeing the angles of the ball better," he said. "I was kind of lost, thinking too much. Once spring training gets moving, you keep taking your time to get better." Baez made a difficult play look easy in the fourth on Sunday when he snared Ryan McMahon's ball behind second base, spun and threw in time to first for the out. "He wants to get better at not chasing certain pitches, he wants to get better at making sure he plays through the ball at shortstop — I'm good with that," Maddon said. "I need to make sure I speak with him and be there to help him because guys like him, you have a tendency to leave alone because they're so confident in their own stuff that many times you think you're interfering in the thought process, because he has a good thought process. I have to be mindful of that and know when to interject." Maddon is considering batting Baez fourth behind Kris Bryant and Anthony Rizzo. Baez doesn't care. "I'll do anything for the team," Baez said. "I'll be ready for the fastball." Teams need a new game plan against Baez this season. "They're going to pitch to me a little differently this year," Baez said. "Hopefully, I have K.B. and Riz around me. They have to pick one guy to pitch to. We'll see what happens." NOTES: The Cubs have Monday off but opening day starter Jon Lester will throw in a minor league game to stay on schedule. Chicago opens the regular season on March 28 against the Texas Rangers. ... Reliever Brandon Morrow (right elbow) was expected to throw off the mound for the first time on Monday as well. He's expected to miss the first month of the regular season as he continues his rehab. ... Reliever Pedro Strop (right hamstring) is continuing to throw from flat ground.